Looking for an easy out from a lousy date? Feeling like a rat in a phone-tree maze? Wishing that someone could transcribe your voicemail messages and e-mail them to you? With this assortment of phone tips, tricks, and services, you’ll be able to navigate your phone with MacGyver-like ingenuity. Collected here are the best Web sites, services, and apps available to help you get more done with your phone. I’ve organized them by phone type. In this article, I introduce you to Websites and services to enhance any phone. Here’s how to bypass automated menus, transcribe voicemail, make free calls, and more. At best, automated menus are necessary evils of modern life; at worst, they’re a pain in the neck. Press 1 for English, 2 for billing, 3 if you hate phone-tree menus. Fonolo.com offers a way to skip automated menus. This Web-based service has mapped out the automated directories for hundreds of large companies from Apple to Visa, and lets you browse their phone menus online. All you have to do is select where you want to go; Fonolo then calls your phone and connects you directly to the menu spot you wanted. You can also use Fonolo to set up shortcuts for entering frequently used numbers in automated services, such as your mobile account number or your frequent flyer miles card. Fonolo is free to use, but you have to sign up as a member to get access to Fonolo’s complete directory map for each company. iPhone owners can also use Fonolo’s iPhone app. 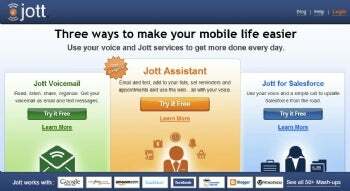 Jott Assistant is a voice-to-text service that lets you call one toll-free number and update everything on your calendar, social network page, blog, or to-do list. Jott works with more than 50 Web services and desktop productivity applications, including Blogger, Facebook, Google Calendar, Outlook, Remember the Milk, Twitter, and WordPress. You can use Jott to have your RSS newsfeeds read to you; the service also lets you send out e-mail or text messages to distribution groups. Just call 866/JOTT123, and record your message, calendar appointment, or to-do list–Jott Assistant takes care of the rest. Jott Assistant is free to try for a week, and has several paid-subscription and pay-as-you-go plans. However, to try Jott for free, you have to hand over your credit card information. Too much of a coward to tell someone unpleasant news in person? Tell them via voicemail. That’s the idea behind Slydial. This free service connects directly to your contact’s mobile voicemail, freeing you from the worry of having to speak to the person. Call 267/SLYDIAL (267/759-3425) from any landline or mobile device, and enter your contact’s mobile phone number (U.S. numbers only). Then, just leave a message. With any luck, maybe they won’t call you back. Ever wished you could end a boring phone conversation, but not sure how to do it gracefully? If you’re in front of a computer while you’re on the phone, just visit SorryGottaGo.com. This Website allows you to play a wide variety of sound files via your Web browser window. It offers basic stuff like a doorbell, a crying baby, and a second phone line ringing. But it also has some wacky choices, such as the sound of a car accident, sneezing fits, and visits from outer space. Is someone screening their calls via Caller ID and avoiding you? With a Caller ID spoofing service, you can broadcast another phone number in order to trick the person on the receiving end. Online you can find a lot of Caller ID spoofing services, such as SpoofCard and Spooftel, that charge a small fee; most offer a free trial, which can be handy if you want to use Caller ID spoofing infrequently. Turning things around, the company behind SpoofCard also has a service called TrapCall that claims to unmask blocked and restricted numbers. A word of warning about Caller ID spoofing: The U.S. House of Representatives just approved a bill that makes it illegal “to cause any caller ID service to transmit misleading or inaccurate caller ID information, with the intent to defraud or deceive.” The bill is working its way through the Senate, but will likely be signed into law relatively soon. Though spoofing itself won’t be illegal, using it with ill intent and to harass will be. Option one: If the call is important but you don’t need to actually speak to the person, let Google Voice do the work for you. Google Voice offers a free service that uses computer-automated voice-to-text transcription to send your voicemail as either e-mail or text messages to your phone. To have messages transcribed and sent, you’ll need a Google Voice account; if you don’t have one, you can request an invitation via the service’s Website. A quicker way to get an account is to have an existing Google Voice user invite you–so ask around. Once you have an account, go to your Google Voice inbox, click Settings in the right corner, and select the Voicemail & SMS tab. Check the Voicemail Transcripts checkbox at the bottom of the page, and under Voicemail Notifications choose either the Google Voice-connected phone or the e-mail address on which you want to receive voicemail transcripts. Afterward, be sure to give your Google Voice phone number to the person who will call you, or just forward your calls to your Google Voice account. Option two: If you’re stuck in a conference call and looking for a polite way to be alerted to an important incoming call, consider creating a ringtone sound effect like a cough or a sneeze. Two sites, Entertonement and Sound-Effect.com, offer such sounds for a fee. A cheaper alternative to buying a ringtone of someone clearing their throat is to record your own ringtone. Most basic-phone users should be able to do this by creating a voice memo, saving it in the recordings folder, and then assigning that recording as the ringtone. Android users can download the Ringdroid application, and iPhone users can make their own as well. 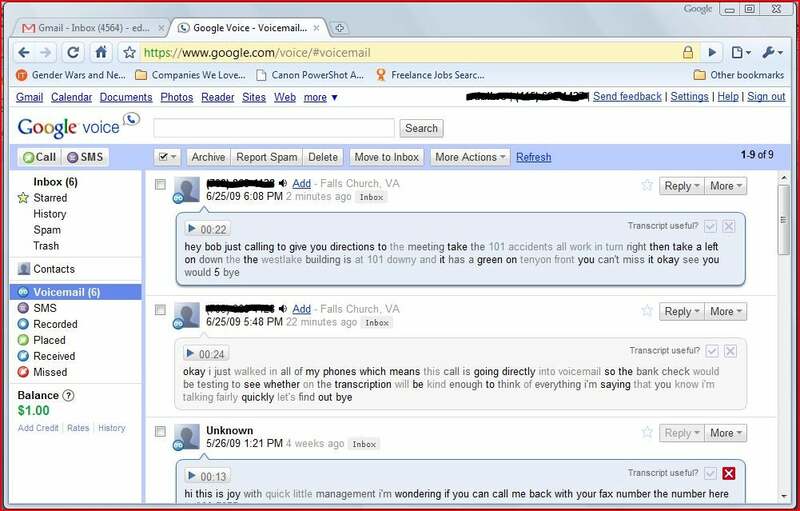 Google Voice can perform other nifty tricks, such as unifying your work, cell, and home phones. The free service gives you one phone number that automatically rings all your other phone numbers at once. As soon as one of your phone lines answers, the other lines stop ringing. You’ll find tons of other Google Voice features, too, including the ability to share voicemail with other users, to screen callers, and to start a conference call. The service also offers free SMS and custom voicemail greetings, and you can even record a call to play back later. Most Android phones come with the Google Voice application preinstalled; other smartphone owners, including iPhone and Blackberry users, can go to the Google Voice Web app at m.google.com/voice to make phone calls, send an SMS, or read voicemail transcriptions. As more households ditch their landlines and come to rely 100 percent on mobile phones, an unforeseen problem has emerged: With no kitchen phone around, people no longer have a way to call their misplaced cell phone and wait for it to ring from between the couch cushions or under the bed. That’s where the free Web service WheresMyCellPhone.com comes in. Visit this site and type in your cell phone number, and the Website will call your phone for you. Just follow the ring to find your handset. Phonevite is a great service for softball teams, party hosts, and anyone who works with a group. The service allows you to broadcast a 1-minute voice message to 25 phones for free. This could come in handy if you are ever faced with something like a last-minute rain delay and you need to call the entire team to let them know. With Phonevite you can also schedule your calls to go out later in the day, and recipients can use their dialpad to respond to your message by entering 1 for Yes, 2 for No, or 3 for Not Sure. Before you use Phonevite, you need to set up your service online, where you can also define the distribution groups for your messages. Phonevite is free to use twice every 30 days; if you need to send messages more often, or if you need to add more recipients, check out Phonevite’s premium service, which allows you to send 2-minute messages to a maximum of 30,000 recipients at once. A similar service, Call-Em-All, lets you send audio or text messages, but does not have a free version as Phonevite does. If you have a cell phone plan that allows you to call a limited number of preferred phone numbers for free on any carrier (such as AT&T’s A-List or T-Mobile’s MyFaves), try this trick to get free voice calls. Add your Google Voice number as one of your faves in your carrier plan, and then authorize your cell phone as one of your Google Voice-connected devices (this is a one-time-only step). Now just call your Google Voice number, and press 2 when your voicemail picks up. The service then prompts you to dial the number you wish to call–and suddenly you’re making a free phone call to anyone you want. This trick worked when a colleague of mine tried it, but I suspect that it’s a loophole too good not to be plugged up by the wireless carriers. But try it out, and see if it works for you. Bidding on a classic Amazing Spider-Man comic book on eBay, but unable to sit in front of your computer all day to make sure you don’t get outbid? Activate your SMS notification preferences to find out via text messages if you’ve been outbid. You can also rebid on an item or configure the alerts to notify you 10 minutes before the auction for a particular item closes. eBay notifications are free to use, but you must register your phone by going to your My eBay page, clicking Account, and then selecting Notification Preferences. Standard messaging rates apply. If you use the Mint Website to track your finances, you can have your over-budget alerts, bill reminders, and weekly financial summaries sent to you via SMS. Just sign in to your account at Mint.com, select Your Profile in the upper-right corner, and choose Email & Alerts to adjust your mobile alert settings. The Weather Channel will let you subscribe to daily 36-hour forecasts via SMS for free. Check out Weather.com’s SMS page for more information. You can also get weather on demand by texting your zip code or your city and two-letter state abbreviation to 42278 or 78676.